Gas giant. From Saul Bass / Ray Bradbury short film, "Quest"
Explore the list of exoplanets  worlds that have already been discovered beyond our own star system. In our search for Earth like planets, find out what is required in the making of a habitable planet. Take a fresh look at a chart on the solar system, pictures of the planets in our own, "home" star system and detailed facts of all the major bodies. The space between star systems is hard to fathom without actually crossing those great, dark oceans of space. Visiting the worlds beyond our home system requires that we cross those vast distances. Short of flying your own starship, these pictures may help bridge the conceptual gap. What exactly are stars, planets and moons? What are the terms used to label these heavenly bodies? 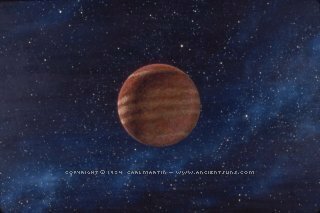 A 2004 study (D. Fischer, J. Valenti, and G. Marcy) has shown that, of the planets discovered so far, their suns tend to have greater iron content than those stars without planets. Said another way, it would seem that planets tend to form with greater frequency in star systems with greater iron content. The graph, below, shows the emerging relationship between stars with planets and their iron content. From a chart by D. Fischer, J. Valenti, & G. Marcy. (2004). "Spectral Analysis of Stars on Planet-Search Surveys." IAU S219, Stars as Suns: Activity, Evolution and Planets, ASP Conference Series, ed. A.K. Dupree.